About this time last year I noticed a lot of bookish people on Twitter talking about World Book Night. Founded in 2011 in the United Kingdom and 2012 in the United States, World Book Night is an annual April 23rd giveaway of thousands of free paperback books. As I read more about the program I recognized many parallels with the Armed Services Editions book giveaway program during WWII. Despite the similarities, the founders of WBN were not actively following the ASEs as a model. These days the memory of the Armed Services Editions resides mostly in the minds of vintage book collectors. So, this year I thought it would be interesting to compare the two book giveaway programs. 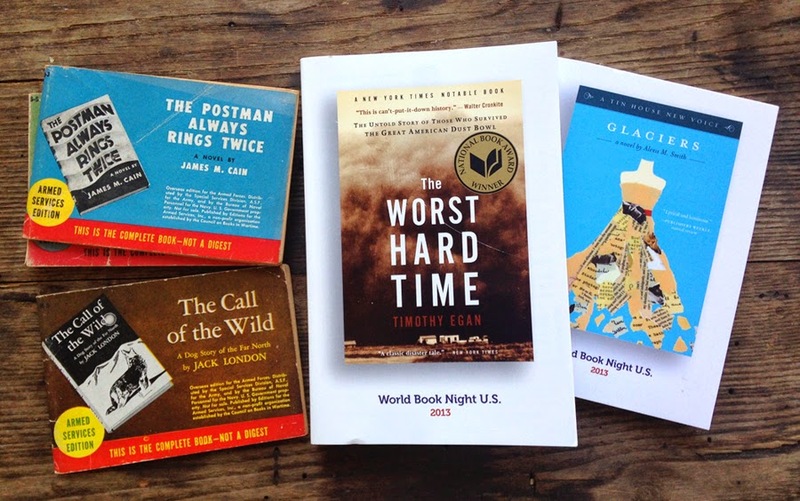 Today’s World Book Night is an international event (US, UK, and Ireland). The Armed Services Editions program of the 1940s was limited to Americans, so I’m focusing my comparison to World Book Night US. World Book Night US is run by an independent nonprofit organization. World Book Night UK also began as an independent charity, but now it is one of several programs run by The Reading Agency. In 1943 the Armed Services Editions was one of many programs managed by a US nonprofit organization, the Council on Books in Wartime. In January of 1944 it was spun off into its own independent nonprofit corporation under the name Editions for the Armed Services, Inc. Although it was then legally separate from the CBW, the same people staffed the two organizations. The organizations managing the book giveaways in the 1940s and today were headed by book publishing professionals. Members of the Board of Directors of World Book Night US include executives from major publishers, book distributors, and book sellers (see staff listing on their website). The Board of Directors for the Council on Books in Wartime was filled with the similar publishing leaders, often representing the very same publishers then as today (see the full list in my earlier post). World Book Night and the Armed Services Editions have both taken existing popular books and repackaged them as specially-branded paperbacks to donate to people unused to reading recreationally. The book selection process for the two programs appears to be very similar. The 30 to 35 WBN US books each year are chosen by a panel of librarians and booksellers. Books chosen for the ASEs (30 to 40 each month) were decided by a special committee of publishing staff, librarians, and booksellers. Because the ASEs were destined for the troops, the selection committee also included a representative from the Army, the Navy, and the government’s Office of War Information. World Book Night titles are recently published fiction and nonfiction books, along with some classics. Likewise, the titles selected for the Armed Services Editions were new general trade books with classics that were not already available as paperbacks. Both organizations have sought to pick quality books that would likely be entertaining to people who are not in the habit of reading. The World Book Night website says that their books are given to people, “who don’t regularly read and/or people who don’t normally have access to printed books, for reasons of means or geography.” The same could be said of the Armed Services Editions program. While WBN US donates books to the public across the United States*, the ASEs were distributed by the military to Americans serving abroad. Red Cross and USO clubs, permanent military bases, and large navy ships sometimes had a small library, but the selection was limited. These military library books reached only a small percentage of American troops, and as one officer in the Army Library Service wrote, “The collections varied from mediocre to bad.” GIs in the field or at sea had virtually no ordinary access to books. Having grown up during the Great Depression, many of the GIs were reading recreationally for the first time thanks to the ASEs. *WBN US also donates books to the military through individual volunteers and by partnering with Operation Gratitude. Authors and publishers involved in WBN agree to forgo royalties. The publishers of books included in the list are responsible for their respective printing costs. Further funding is provided by donations from various members of the publishing industry (see list of 2104 WBN Partners) and individuals. Volunteers distribute the books locally. During WWII the US government paid for the production, storage, shipping, and distribution of the ASEs. There was a 1 cent royalty for each copy. Half a cent was paid to the author and half a cent to the publisher. ASEs were shipped overseas along with other military supplies. Armed Services Editions from my collection alongside a couple titles from the 2013 World Book Night US. Both the World Book Night books and the Armed Services Editions were printed specifically for the giveaways. Books from both programs were printed as paperbacks (hardcover books would be more expensive to produce and ship). WBN and ASE books were printed with specially-branded covers. While WBN paperbacks are the same size as general trade paperbacks (6 x 9 inches, 5½ x 8½ in, etc. ), ASE paperbacks were printed much smaller (5½ x 3⅞ inches or 6½ x 4½) in order to fit in a GI’s pocket. In a previous post I wrote a detailed description of the production of ASE paperbacks. In its first year the World Book Night in the UK was called, “the biggest book giveaway ever” (see “World Book Night giveaway goes international” on The Guardian). In 2011 WBN UK distributed one million copies in Britain. The next year WBN UK printed one million books again, and WBN US debuted with 500,000 for American readers. That’s a combined 2,500,000 books in two years’ time. In 1943, the first year of the Armed Services Editions program, a whopping six million free books were printed for distribution to GIs. In 2013 WBN UK reduced its print run to 500,000 copies, and this year they halved it again to 250,000. In 2013 WBN US distributed 500,000 copies, and it moved up to 550,000 for 2014. So, after four years the combined number of US and UK books given away will be 4,300,000. From 1943 to the fall of 1946 123,535,305 ASE books were put in the hands of GIs. ASEs continued to be printed for the US troops who served in post-war Europe and Asia. By the summer of 1947 the final total of books printed was 108,512,000. With the backing of the US government at war, the Armed Services Editions is likely to remain the biggest book giveaway ever. 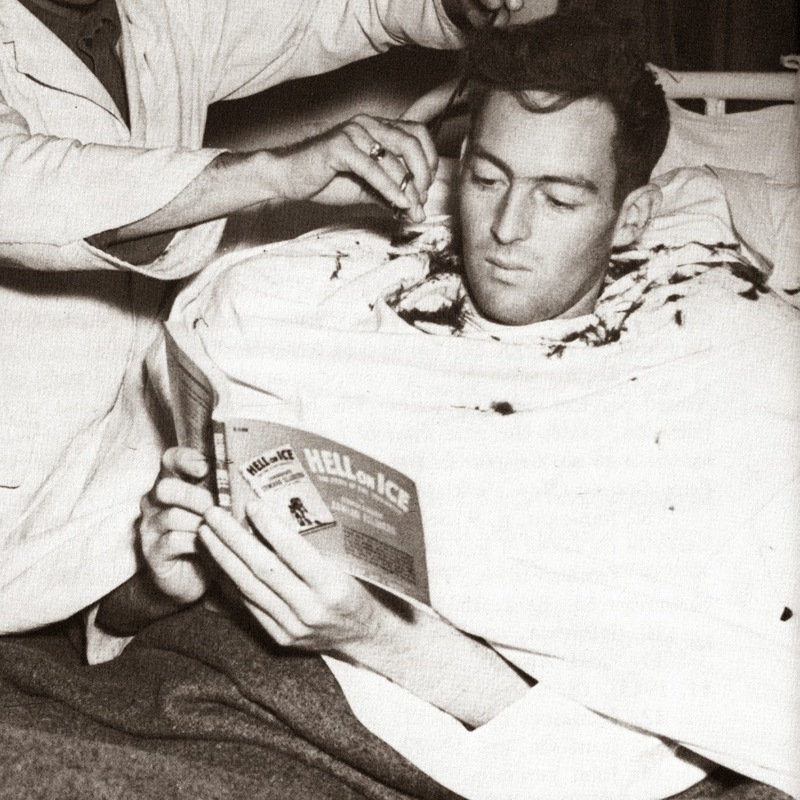 A recovering GI getting a haircut and reading the Armed Services Edition of Hell on Ice, by Edward Ellberg. World Book Night has had a passionate response from book-lovers. Tens of thousands of people volunteer every year to be the book givers who distribute the free books. Givers follow up with the recipients, and you can read some of their reader feedback on the WBN US website. When World Book Night debuted there was concern from some booksellers that the free books would hurt their sales. Some authors thought that the giveaway would devalue the public perception of books. Yet, it is ordinary for the book publishing industry to give away thousands of free books every year as advance reader copies. Free books create word-of-mouth, which sells more books. The hundreds of thousands of books given away on World Book Night are actually good for business. Publishers’ Weekly reported that the titles included in the 2013 WBN US saw a 32% sales increase after the giveaway. Considering the millions free books involved in the Armed Services Editions giveaway, publishers in the 1940s were very wary of flooding the market. Their agreement with the US government stipulated that the ASEs were not to enter civilian hands. Initially the ASEs could only be distributed outside the United States. This rule was relaxed somewhat when the Council on Books in Wartime allowed ASEs into military hospitals on US soil (but the books had to be destroyed after reading). The flimsy paperback books themselves were designed to be disposable. When the war ended excess stock in government warehouses had to be pulped. The ASE program was very good for business. It cost publishers almost nothing, and the free books encouraged the habit of reading to millions of men in the military. This is thought to have been one of the reasons for the boom in book buying in the later 1940s and 1950s (see my post on The Great Gatsby). ArmedServicesEditions.com A great resource devoted to ASEs. The Guardian has numerous articles about World Book Night. A History of the Council on Books in Wartime, 1942–1946. New York, 1946. The CBW published this history before the nonprofit corporation was dissolved in 1946. Jamieson, John. Books for the Army: The Army Library Service in the Second World War. Columbia University Press, New York, 1950. Jamieson, John. Editions for the Armed Services, Inc.: A History, Together With the Complete List of the 1,324 Books Published for American Armed Forces Overseas. New York, 1948.